As I'm working on getting back into the groove of teaching aerial silks again, I've been spending a lot of time getting re-acquainted with skills and my old bag of tricks and tips I used to religiously preach to my students in class. During some of my movement studies these past few days, I have noticed that knack for picking out particular body alignment issues has reached a heightened sensitivity once again. I've greatly attributed my ability to pick out particular movement issues to having to learn everything myself from the self taught pole dancer YouTube generation before there was the existence of pole studios and pole instructors as well as my assessment skills I was trained to develop from being a nurse. Some of the classic movement mistakes I see students make can easily be corrected. I wanted to share a few of the common mistakes with my readers so they too can focus on incorporating these tips into their practice. 1. Sunken chest. I see this a lot in floor work. The shoulders are rounded and the upper back muscles are not engaged. While this is a natural state to want to round the shoulders, it is not an aesthetically pleasing posture and leads to you missing out on working those abdominal muscles in the movement to achieve your desired affect. 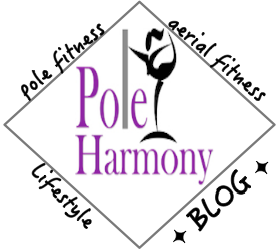 While pole work can be fun, it's also a workout and you want to reap the benefits of each and every single movement. 2. Flexed feet in the climb. The points of contact in the basic pole climb include the knees and ankles. Most people will default to strong arming their climbs and neglect the use of their legs which results in over and unnecessary use of the tops of the feet. I have always taught the climb as being 90% legs and 10% arms. When the leg contact points aren't properly engaged, it leads to using the top of the foot, particularly the foot behind the pole, which creates a flexed foot. The flexed foot is bearing weight. In a proper climb, the knees and ankles are taking the weight which allows both feet to point for clean line approach to the climb. 3. Micro knee bends in straight leg inverts. The micro bends in the knees during inversions are the body's way of telling you that your abdominal muscles are not quite strong enough or are not properly engaged when performing this skill. Focus on engaging the abdominal muscles prior to inverting or working on ground abdominal conditioning exercises to better prep your muscles for completing this skill.